Faircloth Drywall Sheetrock Repair in Raleigh, Durham, Chapel Hill, Apex and Cary N.C.
Faircloth Drywall and Sheetrock Repair is fully bonded and insured with a 2 year guarantee on all work. We specialize in drywall repair and installation. 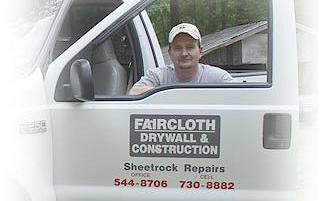 Faircloth drywall and sheetrock repair do their work personally, that means no sub-contractors or lead service. We provide service all around the Triangle area. For over 32 years we have serviced homeowners, HOA's, property managers, designers and contractors. We have developed a reputation for high-quality work, uncompromising professionalism, and integrity. These qualities have made this business one of the area's most respected and in-demand drywall repair contractors. We have built excellent relationships with homeowners and have remained committed to providing every customer with the resources and personnel necessity's to complete their drywall project in a timely manner and cost effectively as possible. Faircloth Drywall is a talented professional drywall repair contractor who works diligently to ensure that every project is completed with as little inconvenience as possible. We understand that we've been invited into your home to perform a much-needed drywall repair service, and as your guest, we will conduct ourselves in a professional manner and maintain a neat and clean work area. I will also provide a written estimate before the drywall begins, so you will know how long I anticipate the job to take and how much the final cost will be. I pride myself on reputation and commitment to my community. My high level of customer satisfaction and quality have allowed us to consistently surpass your expectations for professionalism. Our professional drywall repair Services has become one of the area's leading drywall and plastering repair contractor with an impressive resume of residential repair and restoration projects. At the heart of our success is our belief that no two repair projects are identical. Each has its own unique character and functionality. Our primary focus is quality workmanship. When your drywall or plaster has water damage, stains, or cracks, I can repair or restore it. Your expectations will be exceeded with professionalism and quality, because I'm as picky as you are. So do not hesitate. Call today for all your drywall repair projects. Remodeling and home improvement can be overwhelming, you need contractors who are responsive and dependable. What seems easy in the planning stages can get bogged down in execution unless they have the skills and experience to make your dreams into reality. You don't show up to a stucco fight with a putty knife. Services offered drywall repair, popcorn ceiling repair, popcorn ceiling removal, ceiling repair, tape damage, nail pops, screw pops, wallpaper removal, taping, painting, wall repair and ceiling patching, repairing cracks, holes, drywall skim coat - level 5 finish. All drywall material I use today (joint compound, drywall tape) are the best on the market,I stay up to date on all drywall material and all of our drywall material is biodegradable and safe. Call (919) 730-8882 to schedule a free estimate. Have a house at the beach that needs some work? We now offer professional drywall work in and around the Wilmington, NC area.